Alleged Sept. 11 Plotters In Court, But Lawyers Do The Talking The brief courtroom session provided a glimpse of the accused plotters, including Khalid Sheikh Mohammed. But the discussion focused on whether U.S. intelligence is listening to attorney-client conversations. 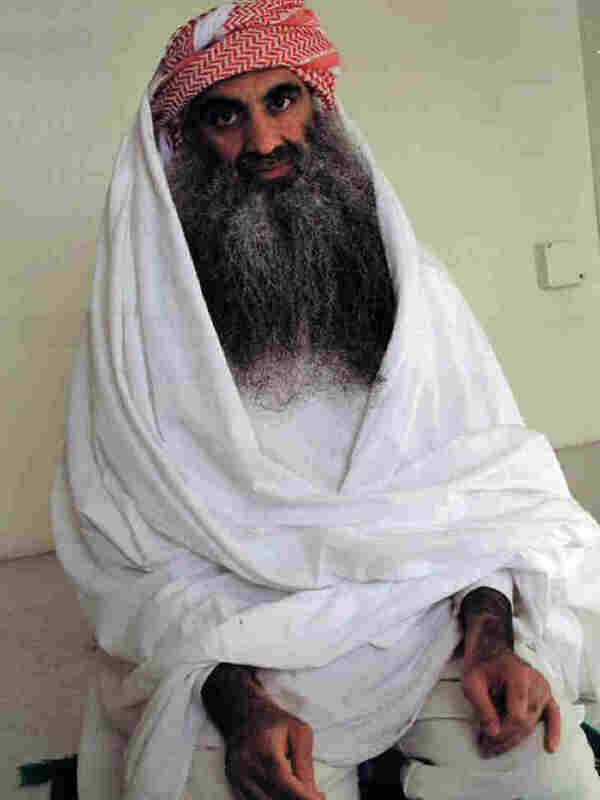 Khalid Sheikh Mohammed, seen in a file photo, and four other defendants accused of the Sept. 11 terrorist attacks appeared before a military commission in Guantanamo Bay, Cuba, on Monday. The session focused on procedural matters. Pretrial hearings in the death penalty trial of Khalid Sheikh Mohammed and four other men accused of planning the Sept. 11 terrorist attacks lasted a little more than an hour Monday before the judge recessed the session until Tuesday. The men, who all came into the courtroom in camouflage vests and traditional garments known as shalwar kameez, have been in jail — awaiting this trial — for more than a decade. They were arraigned back in May, didn't enter pleas, and their trial has been moving at a plodding pace ever since. Monday's session offered a prime example: The dozens of defense attorneys, prosecutors and guards all gathered to discuss courtroom microphones and whether U.S. intelligence officials are secretly listening in on attorney-client conversations. The latest kerfuffle began several weeks ago when David Nevin, the attorney defending Khalid Sheikh Mohammed, was telling the judge that the defense wanted to argue a motion to preserve whatever remained of the CIA's black sites overseas as part of the defense's efforts to discuss what happened to their clients after they were captured. Prosecutors had filed a classified response to the request, and as Nevin began reading the title of the motion, a spinning red light on the judge's bench suddenly lit up, and the audio and visual feeds from the courtroom went dead. Everyone looked around in surprise. Because the military commissions at Guantanamo need to keep classified information from getting out to the public, the audio feed from the courtroom is on a 40-second delay. When something classified is said — a censor who sits next to the judge pushes a button and starts the light spinning, and sends white noise to listeners outside the courtroom. During Nevin's argument, however, the feeds were cut off not by the judge or the prosecution, but by some third party. "If some external body is turning the commission off based on their own views of what things ought to be, with no reasonable explanation," Judge James Pohl, an Army colonel said at the time, "then we are going to have a little meeting about who turns that light on or off." No one seemed to know, until that moment, that there even was a third party that could cut the feed. "What that did was add another level of concern for the defense, and it played directly into their challenge to the legitimacy of the trial," says Wells Bennett, a visiting fellow at the Brookings Institution. And that's more or less where Monday's hearings began: with the question of who is secretly monitoring the trial and what they are able to hear. The five defense attorneys were all reading from the same playbook — worrying aloud that this unseen force, which presumably is the CIA, was listening to the private attorney-client conversations for intelligence purposes. Judge Pohl kept asking for evidence that eavesdropping was happening, and the defense kept saying it needed time to prove that it was. An hour later, the judge had given the defense attorneys a day to investigate their motion, and the prosecution had suggested a partial solution: changing the microphones so they are push to "talk" instead of push to "mute." With those two things decided, the judge adjourned the session for the day. The hearings this week, however, are shaping up to be as much about the court system created to try terrorists at Guantanamo as it will be about the men in the dock. "The defense doesn't spend time attacking the jurisdiction, legitimacy or the authority of the Southern District of New York or the Eastern District of Virginia; that's kind of the color of the wallpaper," says Ben Wittes, who edits and writes for the Lawfare blog, which, among other things, tracks the progress of the military commissions. "In the military commissions you have all the litigation you'd have in a federal court, but then you have this other layer in which people are arguing about the tribunal itself," he says. "My staff and I spent a full week diligently running every rumor to ground, and I can say unequivocally that no entity of the United States government is listening to, monitoring or recording communications between the five accused and their counsel at any location," chief prosecutor Brig. Gen. Mark Martins said in a statement on Sunday night. He said his staff had done their best to "prove a negative." "There are a whole bunch of problems with Guantanamo," says Karen Greenberg, who runs the Center on National Security at Fordham Law School. "The question is: Can they get around these issues in such a way to try these cases [and] bring them to a conclusion in a way that you can say we had a legitimate courtroom proceeding that has democratic standards attached to it?" Greenberg says. "It is extremely difficult." The secret monitoring of the proceedings is just one example of a host of problems. Wittes says the commissions have been bogged down — the arraignment in which the defendants didn't even enter pleas was nearly a year ago — because lawyers aren't just litigating the facts of this case, as you would expect in federal court, but are arguing about the tribunal itself. "Unlike a federal court proceeding where you have many, many years and decades of trial practice and precedent, in the military system you don't have that reservoir of experience," he says. "Neither the judge nor the lawyers can say this is the way we've always done it, so they have to discuss everything." The defense motions still on the docket for this week, for example, include several attempts to get all the charges dismissed on procedural grounds. The defense says the charges weren't filed properly and that the retired admiral who oversees the commissions wasn't constitutionally appointed. Those kinds of issues were settled in federal court long ago, not at Guantanamo. This goes a long way toward explaining why at this early stage in the trial, the prosecution is hardly getting a word in edgewise. That will happen later. "As you get closer to a trial you talk more about factual issues, a lot more about who did what," says Wells Bennett. "And that's not really something the defense wants to get into."